Graham Mayhew will give us in his talk a fascinating insight into the lives of the monks of St Pancras Priory based on his research for his recent definitive book about St Pancras Priory, Lewes, ‘The Monks of St Pancras’. He will describe the monks’ daily routine, the festivals and special occasions that marked the passing of each year, and the principal stages of a monk’s career. Taking the life of one mid-15th century Lewes monk as an example, he will trace his career from his entry into Monks Horton, Kent, one of Lewes’s subsidiary priories, through to his arrival at Lewes as a priest and his subsequent rise to becoming chamberlain, responsible for all of Lewes Priory’s properties in England and his ultimate appointment as prior of Lewes. 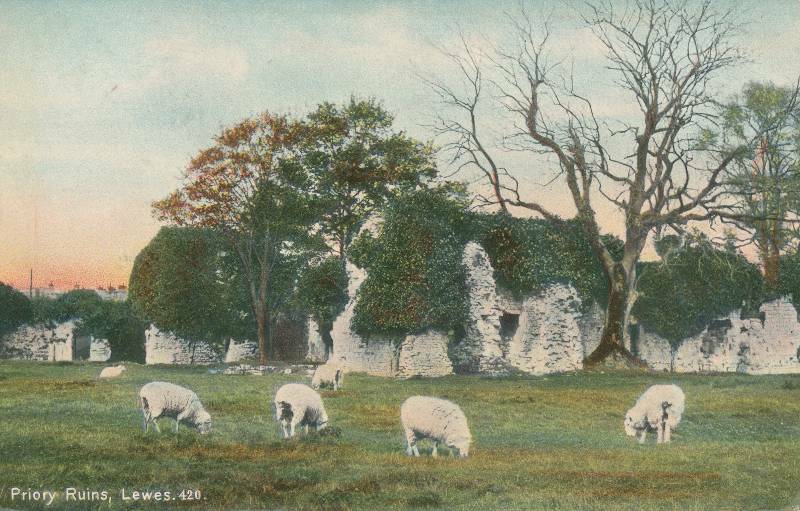 The talk will explain the relationship between Lewes Priory and its daughter houses and its role as the mother house of the Cluniac Order in England, its vast church providing the setting for the fullest and most elaborate expression of the Cluniac liturgy in the British Isles. Graham will outline a typical day at Lewes as well as exploring the annual calendar of feasts and some key annual events such as Easter and Christmas, showing how the priory church and monastic buildings were used on major feast days and other important events in the life of the monastery, and will conclude with a brief assessment of the personal qualities expected of a prior of Lewes. 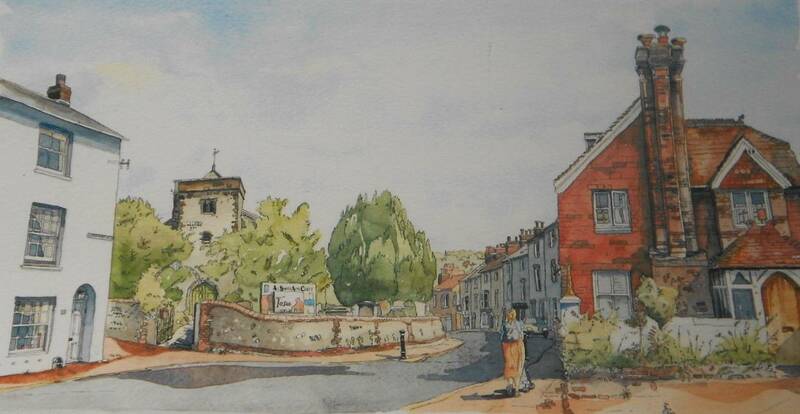 This watercolour entitled ‘Lewes & the Ouse’ by Hagop Kasparian, dated June 1991, shows a classic view of the approach to Cliffe from the south, sadly changed by new construction currently underway. Part of the collection of the late Ian Askew of Wellingham, Ringmer, was auctioned by Dreweatts at Newbury in April. 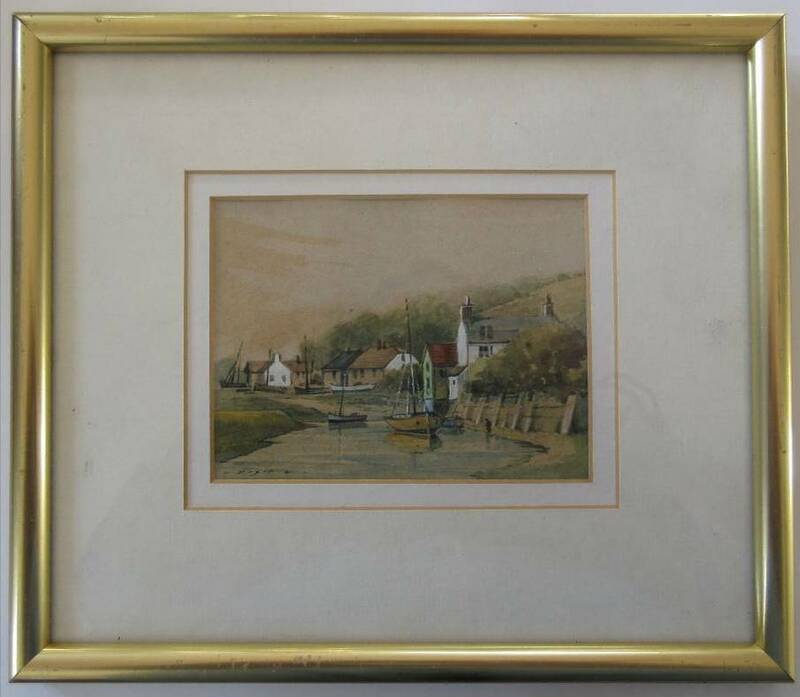 Lot 206 was this watercolour by James Lambert the elder of Lewes (1725-1788). 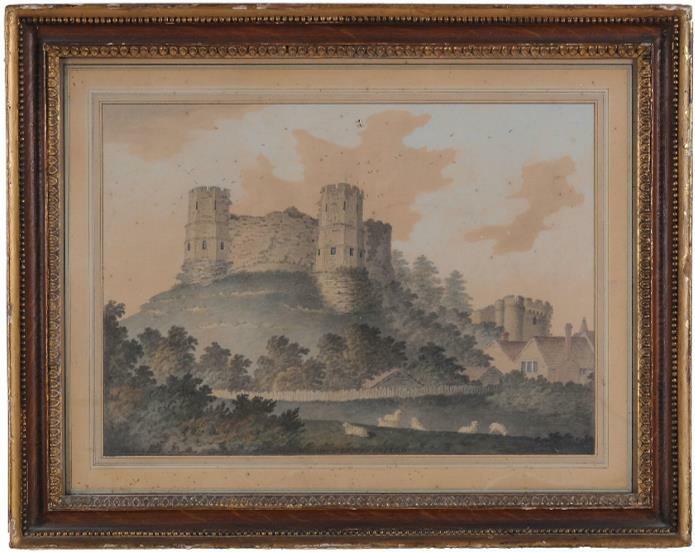 Signed and dated 1786, it shows the west view of Lewes Castle. It sold for £300. The 1861 census lists as resident in the prison in St Anne’s parish the governor (John Sanders aged 62, a Cornishman), the chaplain (Rev Richard Burnet, 54, born in Dublin), a matron, a porter and nine warders – 6 male and 3 female. The governor, chaplain, porter and one warder were accompanied by their families. There were a total of 210 prisoners, 160 men and boys, 47 women and girls and 3 infants. The three toddlers were described as prisoners, but each accompanied a woman with the same surname. The youngest prisoner was John Durrant, a bootblack aged 12, but 5 boys and one girl were under the age of 15. There were another 38 older teenagers – indeed for females the most common age group was 15-19. For both genders more than half the prisoners were under the age of 30. The oldest prisoners were an Irish shoemaker and a carpenter from Ripe, both aged 75, but only 5 men and one woman were over 60. Just 10 prisoners, nine males (including the 12 year old bootblack) and one female were natives of Lewes. Some of the men are ascribed occupations one might not expect to meet in prison. There were two surgeons (one specified as FRCS), a surgeon dentist, an attorney, an architect, a brewer, an auctioneer, a master mariner, a furniture broker and a retired dancing master. There were a scatter of tradesmen – a farmer, a ‘farmer and bather’, a builder, a butcher, a baker, a grocer, a linen draper, a lime burner, a cabinet maker, a wheelwright, a blacksmith, a licensed victualler and a contractor of mail carts. Perhaps less surprising were a horse dealer, a selection of hawkers and hucksters (of both genders) and no less than 8 soldiers, plus a soldier’s wife aged 16. This old image of the Elephant & Castle comes from one of a batch of about 20 glass plates discovered abandoned in a shed by a previous resident. The photograph was posted on the Lewes Past Facebook page in April. Note the cattle trough – see Bulletin no.30. 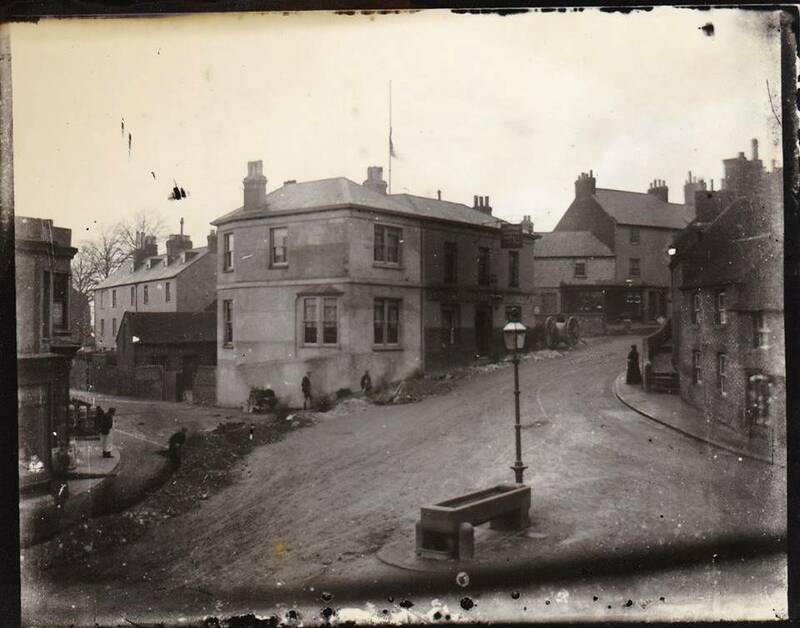 At the date the photograph was taken the cattle market was held down near the Pells. The 2 November 1934 Sussex Express noted that work had commenced on a new footbridge over the River Ouse at South Malling. The bridge was being erected by Sir Frank Sanderson, baronet, of Malling Deanery. The 9 November 1936 Sussex Express recorded that Sir Frank Sanderson, baronet, M.P., and Lady Sanderson of Malling Deanery had made an offer to provide South Malling with a new church hall as a Coronation gift. This entry was posted in Art & Architectural History, Ecclesiastical History, Legal History, Lewes, Local History. Bookmark the permalink.